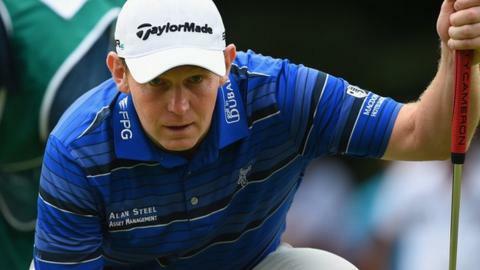 Stephen Gallacher kept his outside hopes of making the Ryder Cup alive with a fine 65 in the second round at the Italian Open, led by Hennie Otto. The Scotsman needs a top-two finish in Turin to overtake Graeme McDowell in Europe's final automatic qualification spot for September's Ryder Cup. At seven-under par, he is five shots behind second-placed Bernd Wiesberger. "There are two more rounds and a lot can happen," he said. "To be in with a shout on Sunday is all you can ask." South African Otto had earlier shot a 62 to establish a three-shot lead over Austrian Wiesberger. Gallacher, 39, had shot a level-par 72 on Thursday to leave him 15 shots back - and 12 off second - going into his second round, but he managed an eagle and seven birdies in Friday's round, six of them coming in a back nine of 30. "It would be nice to follow it up with more of the same," said Gallacher. "I knew I had to go low at some stage and I'm just delighted to get on a run on the back nine. "I don't think I could say on air what I was thinking when I saw the leaderboard at lunch. It was a strange feeling. I was looking at the guy who was second to be honest, to try and catch him up a bit, and a couple more 65s at the weekend and we will see what happens." Italian Francesco Molinari had boosted his hopes of securing a wild card place in Paul McGinley's team with a 66 on Thursday but could only follow that up with a 72.